Episode 27 - We follow Arjun's journey into the Himalayas and beyond. This episode includes Arjun's famous battle with the Mountain Man. He doesn't come out of the fight very well-- Shiva crushes him into a meatball and ends the fight. I like to think that he killed Arjun and then revived him and sent him on to Heaven, but the text is a bit vague; did he just get crushed, lose his eyesight and cease breathing? Or did he go all the way and die on us? Either way, he's sent off to his dad's kingdom up in Heaven where he acquires WMD in preparation for the big battle. Meanwhile, the remaining brothers and their angry wife are left waiting in the jungle, swatting flies, while Arjun spends five years in paradise with Indra. After Arjun has learned all the secrets of Indra's weapons, he is sent to Citrasena to learn the arts of music & dance. 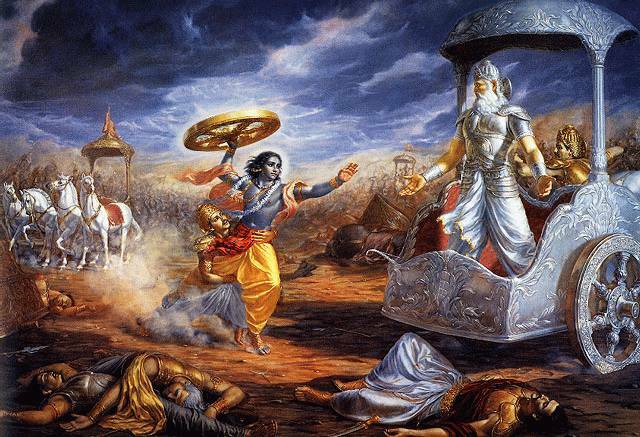 Indra dispatches the sage Lomasha to visit the other Pandavas and tell them to tour the pilgrimage sites while Arjun finishes up his training. Next time, we'll see how Dhrtarastra reacts to news of Arjun's trip to heaven, and we'll hear the famous story of Nala and Damayanti!